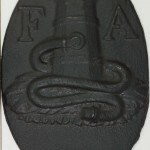 Established by Benjamin Franklin in 1752, the Philadelphia Contributionship for the Insuring of Houses from Loss by Fire was the first fire insurance society in North America and brought together property owners with similar interests in fire protection. 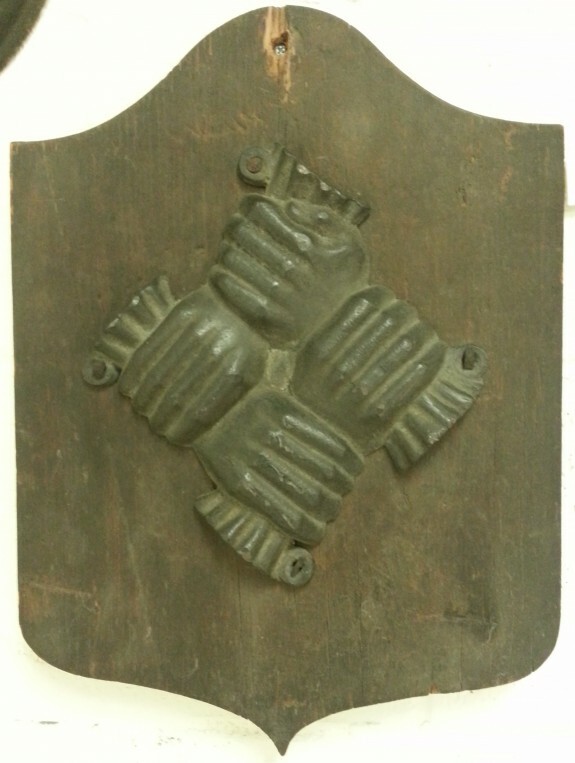 This firemark displays the Contributionship's logo of clasped hands, representing the support that policy owners give to each other. Premium payments of policyholders provided the funds to pay policyholders when their properties were damaged by fire. Businesses and property that were deemed "at risk" for fire had to pay higher premiums than those in safer areas. Private fire companies would use these firemarker to identify which insurance company covered a building. 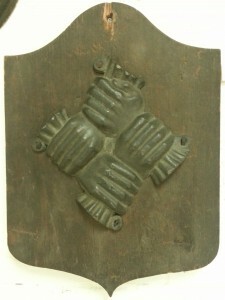 The Contributionship's interlocking hands symbol was created from gilded metal on wood (and later metal) shields, with a policy number listed at the bottom. The clasped-hands symbol still represents the Philadelphia Contributionship today. 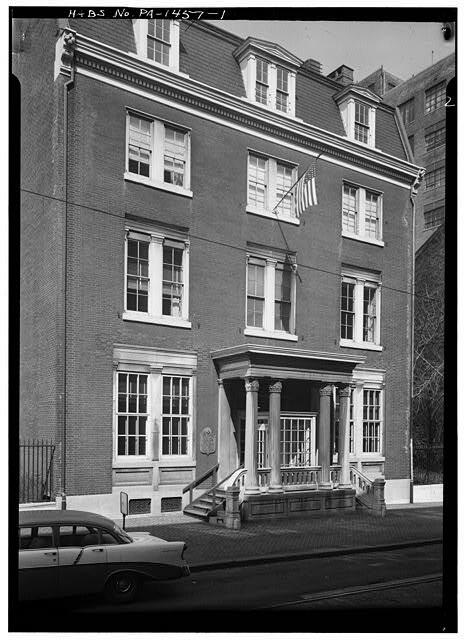 Although the Philadelphia Contributionship was established in 1752 and had thousands of members by the turn of the nineteenth century, the headquarters of the company moved between various houses and taverns until a permanent location was constructed in 1836. Located on Fourth Street between Walnut and Locust Street, the Greek Revival style building was designed by architect Thomas U. Walter in 1835. The building served as a space for offices, a location for board meetings, and as a residence for the Contributionship treasurer's family. In 1898, the building's interior was renovated to incorporate more office space, but the Contributionship continued to grow and expanded into other buildings along Fourth Street. A major renovation in 1969 removed some office space and restored parts of the interior to appear as they did in the nineteenth century. The building became a national historic landmark in 1979 and currently houses a museum dedicated to the Contributionship's history. This photograph shows the front of the building from Fourth Street during the 1960s. 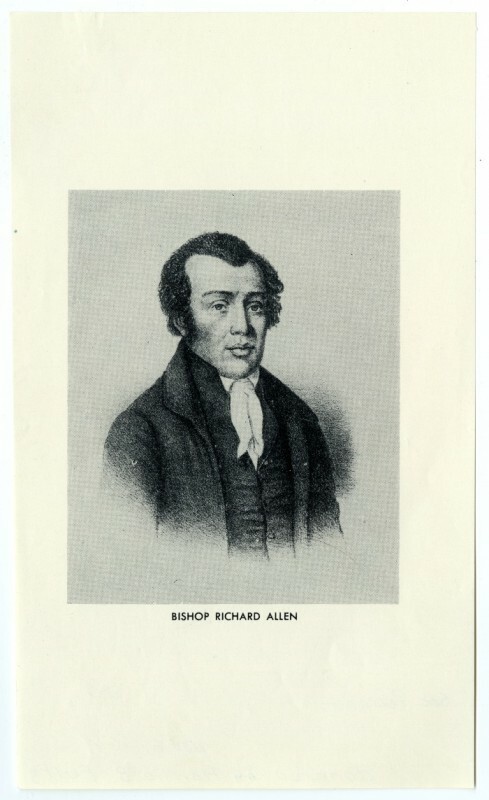 Richard Allen, born in Philadelphia as a slave in 1760, used his role as a Methodist religious leader to support the swelling African American community in Philadelphia by establishing the Free African Society with Absalom Jones. Although born in Philadelphia, Allen and the rest of his family were sold to a Delaware plantation owner in the 1760s. While in Delaware, Allen began to attend weekly Methodist Society meetings, and later became a Methodist preacher after he was able to purchase his freedom. The Methodist preaching circuit allowed him to attend Methodist meetings throughout Delaware, Maryland, New Jersey, and Pennsylvania. After preaching in Philadelphia numerous times, Richard accepted an offer in 1786 to be a weekly speaker at St. George's Methodist Episcopal Church in Philadelphia. Although St. George's was primarily a white church, it had services for the steadily growing African American audience. Preaching at St. George's Methodist Episcopal Church was difficult for Allen and the growing African American congregation that prayed there weekly. Allen had to conduct his sermons at 5 a.m., so that he did not disrupt the service for the white congregation later in the morning. After multiple incidents of white church members forcing African Americans into segregated seating that did not allow room to kneel to pray, Allen and other local religious leaders began to plan churches specifically for the African American population of Philadelphia. Their first step was to create the Free African Society in 1787 to support the local African American community and help recently freed slaves. The Free African Society offered financial assistance to families and educational services for children or adults seeking employment in Philadelphia. Members of the society paid monthly dues in order to benefit from the services, but those funds also fueled more programs to assist the African American community. Over the next few years, a number of solely African American churches were built in Philadelphia. Allen was part of a council that purchased and renovated an old blacksmith's shop to become the Bethel African Methodist Episcopal Church (later known as Mother Bethel). He became the first African American Methodist minister in 1799 and the first bishop of the African American Methodist Episcopal Church in 1816. 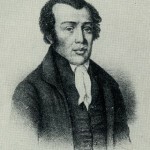 Until his death in 1831, Allen used his ties with his growing congregation and the Free African Society to support the African American community of Philadelphia. When independent fire companies of the 1800s rushed to a building in flames, they had little time to decide if a building was insured. Fire marks like this one helped to identify which company insured a building. 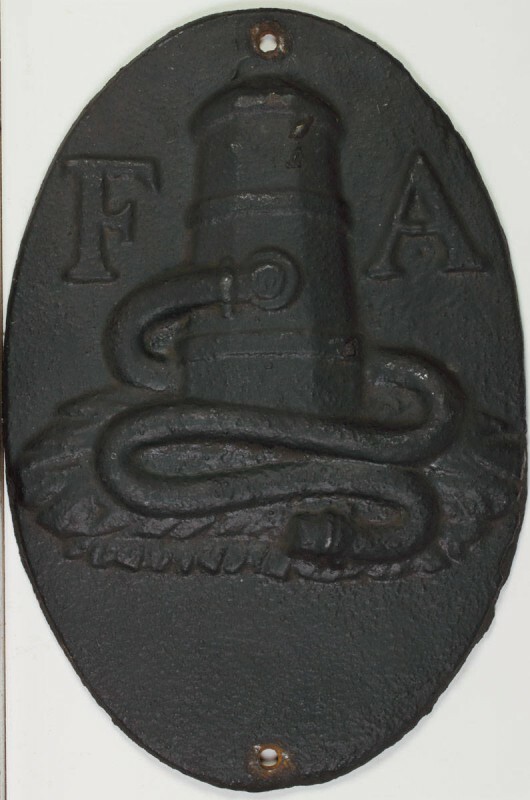 This fire mark was from the Fire Association of Philadelphia, which began issuing these ten-inch by seven-inch cast-iron marks to customers in 1817. The fire mark displays a fireplug (hydrant) with a hose wrapped around it, and the flat section towards the bottom of the mark lists the customer's insurance policy number. More than 40,000 of these marks were supplied to customers in the Philadelphia area. The Fire Association offered a profit-sharing model to more than thirty fire companies around Philadelphia that helped put out fires for their customers. 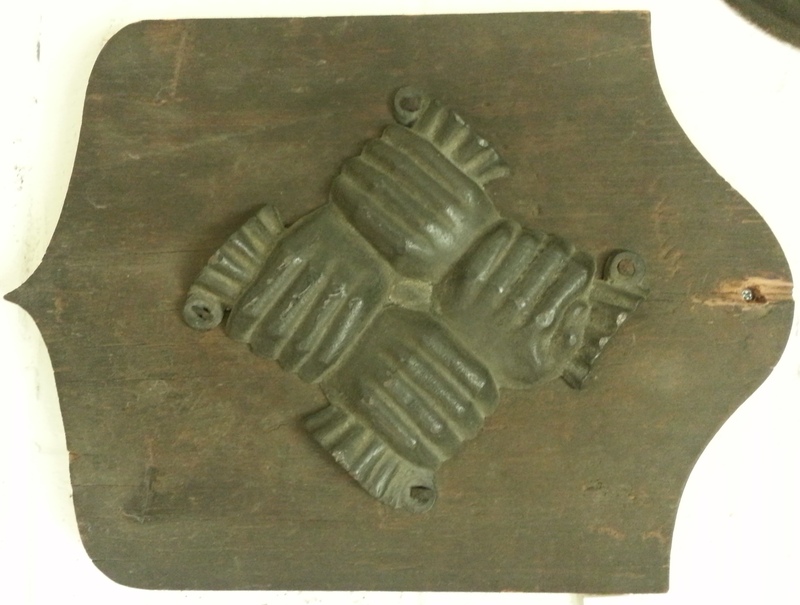 The importance of fire marks diminished in 1881, when the city of Philadelphia started its own fire department, but the fireplug and hose symbol remained as the Fire Association's emblem into the 1900s. 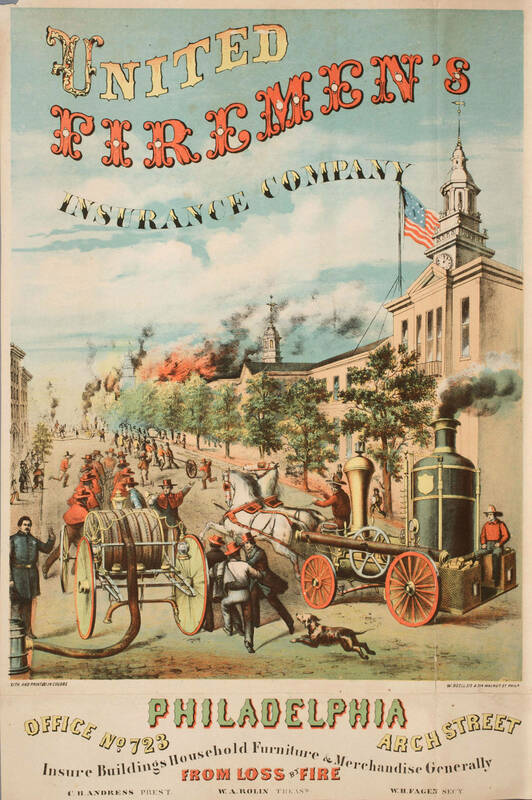 For most of the nineteenth century, fire companies in Philadelphia were independent, and often received pay directly from an insurance collective when they put out a fire. 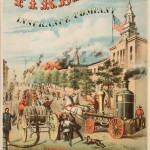 Instead of joining groups like the Fire Association of Philadelphia, twenty-eight fire companies formed the United Fireman's Insurance Company (UFIC) in 1860 to make additional income selling insurance. This 1866 advertisement for the UFIC office on Arch Street shows members of the UFIC rushing past Independence Hall to get to a blazing fire in the distance. 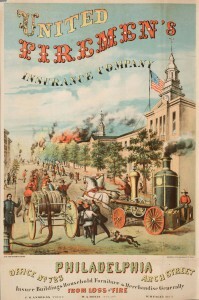 The steam-powered engine to pump water depicted in this advertisement became the UFIC's fire mark and represented its use of new technology, which other fire companies were not using in Philadelphia at the time. In 1925, the Insurance Company of North America (INA) moved into the newly constructed office building at North Sixteenth and John F. Kennedy Boulevard (the building on the right of this photograph) from its previous location on Walnut Street, where the company had been for more than eighty years. Philadelphia-based architecture firm Stewardson & Page designed the building and Stone & Webster Incorporated from Boston constructed the building. The building became a National Historic Landmark in 1978, and INA continued to occupy the building until 1991. The building was later converted into residential condominiums. Insurance is sometimes called an “invisible” element of commerce, but in Philadelphia, it has never been far from view. From the eighteenth century through the twenty-first, Philadelphia’s leadership in the field of insurance has enhanced the city’s preeminence in many types of commercial and communal endeavor. Insurance in Philadelphia, over the years, has meant everything from disability insurance funds managed by immigrants, to “factory mutuals,” through which industrial manufacturers protected one another against the risk of fire, to enormous capitalist ventures in marine and property/casualty insurance. 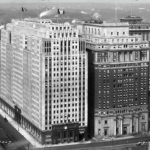 As the business of insurance grew and evolved, it established the city of Philadelphia within global commercial networks, regional zones of economic activity, and statewide legal regimes. From the eighteenth through the early nineteenth centuries, Philadelphia’s leadership in insurance grew out of the city’s deep involvement in global, national and local projects. Perhaps counter-intuitively, the city’s global ventures began first. The establishment of the first marine insurance brokerage in Philadelphia in 1721 demonstrated that the city had become a significant player in world trade. At a brokerage, a Philadelphia merchant seeking to insure a ship or cargo could fill out a detailed policy. Others, usually fellow merchants, would take on a portion of the voyage’s risk by underwriting it—literally writing their names underneath the policy’s text. If an insured ship was lost or property was damaged in transit, the underwriters paid in proportion to the amount for which they had pledged themselves responsible. If the voyage ended successfully, the underwriters shared the premium that had been paid to the broker for the insurance. The appearance of a reliable group of local underwriters created some financial independence for Philadelphia merchants involved in the global marketplace. Insuring locally meant they would not have to spend months negotiating with overseas insurers or tracking down far-flung underwriters reluctant to pay their shares of a claim. Insurance brokerages were numerous in Philadelphia by the mid-eighteenth century; the continent’s largest port city had become the principal provider of financial services for the region’s merchants. Brokers clustered together near the wharves, where they thrived on the constant influx of commercial information from ports around the world. For marine insurers, the term “Greater Philadelphia” would have meant very little: commerce and finance linked them far more closely to their peers in London, Bordeaux, and the West Indies than to inhabitants of nearby towns or of Philadelphia’s rural hinterlands. While the exact number of marine insurance brokers in each town in any given year is difficult to assess, the extent of Philadelphia’s regional dominance in insurance is evident in the degree to which its commercial newspapers—in which marine insurers advertised their services—dominated the region. Philadelphia printed its first newspaper in 1719, and the city’s printers competed with one another in ever-greater numbers over the course of the century. In New Jersey and Delaware, by contrast, not a single newspaper was printed before the American Revolution. In spite of Philadelphia’s prosperity, the city remained a relatively peripheral provider of financial services in the context of Atlantic trade. Even after the Revolution, American merchants generally preferred to acquire insurance in London or other European cities where all kinds of financial transactions were cheaper and more widely available. A real structural transformation in American marine insurance began only after the funding of the debt of the United States in 1790. As Philadelphia became the financial capital of the new republic, enthusiastic investors poured money into public and private projects, including the first marine insurance company in the United States, the Insurance Company of North America (INA). While facilitating Philadelphians’ ocean commerce, INA simultaneously embedded itself in local and national financial networks by investing heavily in the shares of Philadelphia banks and in federal bonds. The success of INA inspired other speculators to charter corporations along similar lines. While Philadelphia’s marine insurers remained dominant in the mid-Atlantic states, capitalists in smaller towns also took advantage of the wealth generating possibilities of insurance companies. In Trenton and New Brunswick, New Jersey, for example, two new financial corporations received state permission to engage in both the banking and insurance businesses. In this fashion, the new companies were able to spread the risks they took with their invested capital across two intertwined and complementary types of business. Marine insurance companies enhanced Philadelphians’ ability to engage in commercial transactions spanning continents, but other types of new insurance groups provided them with security at home. Fire insurance associations and mutual aid societies eased the distribution of aid among neighbors in times of personal and communal catastrophe. Benjamin Franklin (1706-1790) organized Philadelphia’s first fire insurance society—North America’s second—in 1752. Dues-paying subscribers to the Philadelphia Contributionship and later other companies affixed “fire marks”—usually symbols of peace, amity, or patriotism—to the fronts of their buildings to prove their membership. Fire insurance developed in tandem with organized techniques of fire prevention: members of the Contributionship were required to “keep always in good order … a certain number of leather buckets,” and by 1808, a London visitor noted forty operative fire engines in the city. Inhabitants of cities from Boston to Charleston followed Philadelphia’s lead, creating Contributionship-style societies that benefited subscribers as well as joint-stock companies that sold fire insurance for profit. By 1806, Philadelphia boasted eight chartered insurance companies, which did the majority of their business in marine insurance and a smaller portion in fire. Through active correspondence with insurers in Wilmington and Baltimore, the Philadelphia marine insurance companies were able to bring insurance prices around the mid-Atlantic into closer alignment. And although insurance remained principally an urban—and maritime—commercial practice, the establishment of the Lancaster and Susquehanna Insurance Company in 1807 testified to Philadelphia’s deepening connections with its backcountry. While fire and marine insurers protected the capital of the city’s property holders, scores of mutual aid societies provided security to Philadelphia’s more vulnerable residents. In 1787, Absalom Jones (1746-1818) and Richard Allen (1760-1831) formed the Free African Society. Members paid one shilling per month, and were eligible to receive three shillings and nine pence per week in times of need. By 1838, black Philadelphians had founded 119 mutual aid societies with more than seven thousand members. European immigrants began similar projects: Philadelphia’s German immigrants formed at least fifty-six mutual aid societies in the 1830s and 40s. 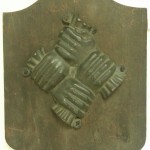 Fraternal orders and tradesmen’s associations also provided crisis insurance to members and their families well into the twentieth century. As the city grew, the size and concentration of its industrial neighborhoods encouraged manufacturers to join “factory mutuals,” through which they insured themselves against catastrophic losses incurred by factory fires. A group of Rhode Island cotton mill owners created the first factory mutual, and the form rapidly became associated with New England manufacturing, but Philadelphia factory owners also adopted the practice, and it grew apace with the city’s manufacturing over the following century. By the 1930s the amount of factory insurance in force in Pennsylvania was $266 million, second only to the amount in force in New York. New Jersey’s factory insurance, $150 million, was also a substantial portion of the national total. The hazards of industrialization taught Philadelphia fire insurers the advantages of doing business outside of their immediate neighborhoods. After the Great Fire of New York bankrupted several New York insurance companies in 1835, Philadelphia insurers pioneered the practice of enrolling customers in other cities using full-time remote agents. In the process of hedging their risks, these insurers forged stronger financial links between Philadelphia corporations and inhabitants of other American cities. Fire insurance companies physically shaped the city of Philadelphia in a number of ways. Their judgments on the safety of different building materials and layouts affected urban architecture, and the detailed maps they generated as surveyors and assessors of urban property became new ways of understanding the city’s built environment. As fire insurance maps demonstrate, the growing scale of insurance in Philadelphia did not simply transform insurance companies into depersonalized vehicles of capital; rather, insurers maintained and even deepened their intimate relationships with urban spaces and their inhabitants. This was as true in the field of life insurance as it was in fire. America’s first life insurance company was founded in Philadelphia in 1809. This company and its imitators targeted the hopes and fears of the emerging middle class. Life insurance was particularly appealing to urban male office workers, who feared their deaths would leave their families indigent, and who appreciated the way insurance companies addressed them as intelligent investors. Enjoying quasi-public status for their roles as caretakers of the potentially indigent, life insurance companies boasted of their own fiscal caution: one nineteenth century business historian wrote that Philadelphia’s American Insurance Company had never undertaken “any spasmodic or reckless efforts to extend its business” and “never lost a dollar by any of its investments.” Imposing life insurance buildings, brick-and-mortar advertisements of corporate stability, became Philadelphia landmarks. The new fields of auto and health insurance emerged very rapidly in the early twentieth century. Both were defined more by state regulations than they were by the demands of port cities. Pennsylvania, a populous state with large numbers of factories and far-flung farms, laid claim to seven percent of the nation’s cars, but was responsible for a full fourteen percent of its traffic deaths. Alarmed by these statistics, state legislators imposed strict regulations on vehicles and drivers in the 1920s, and automobile owners increasingly found auto insurance an appealing option. As most companies in the established lines of insurance hesitated to enter the auto market, new companies were able to grow quickly. The Erie Insurance Exchange, based in the far west of the state, reached $1 million in annual sales by 1946. The success of new corporations such as the Erie Insurance Exchange signaled two important changes in the insurance business. The first was that the wealthy Philadelphia insurance companies of the nineteenth century could not count on retaining their dominance in the twentieth as new lines of insurance emerged. The second was that state laws and regulations were taking an ever-greater role in defining and controlling the practices of insurers; insurance in the twentieth century would be increasingly articulated by state boundaries rather than by global networks of maritime commerce or regional zones of industry. Health insurance, like auto insurance, was a twentieth century phenomenon shaped by the states rather than metropolitan regions. Across the country, advances in technology and the systematic accreditation of doctors spurred demand for ever-more-costly medical services, and more Americans grew interested in acquiring health insurance. Health insurance projects such as Blue Cross and Blue Shield were promoted by national organizations, and like auto insurers, they were regulated on the state level. State regulation even made its mark on the old, established lines of insurance. Soon after 1900, many states started setting fire insurance rates directly, while others began supervising rates set by industry associations. Mutual aid societies run by immigrants, voluntary groups, and trade associations peaked after the immigration boom of the early twentieth century, but declined during the Great Depression, superseded by state and federal aid projects. Insurance, in service of nationwide demands and regulated by the states, lost much of its traditional association with ports, immigrant and workers’ groups, and urban industries. One consequence of the increased influence of the states on the insurance business was the divergent experiences of corporations situated in neighboring states. Where maritime commerce had once bound Philadelphia insurers closely to those of Baltimore and other port cities, and where nineteenth century industrial activity and immigration had prompted regional cooperation among manufacturers and local cooperation among ethnic groups, state legislatures in each of the mid-Atlantic states took their own courses. Delaware, for example, became a national financial center when it passed a series of laws friendly to the banking and finance industries in 1981. These laws established a new corporate constituency in Wilmington and set that city on a course dramatically different from that of nearby Philadelphia. Philadelphia maintained its prominence in insurance through education and innovation. The Wharton School at the University of Pennsylvania offered the country’s first collegiate-level class on insurance economics in 1904, and in 1941 Wharton partnered with industry leaders to form a foundation for insurance research and education. The Insurance Company of North America revolutionized homeowner’s insurance at mid-century by bundling insurance against fire, theft, flooding, and other hazards into a single “package homeowner’s policy” that quickly became standard. 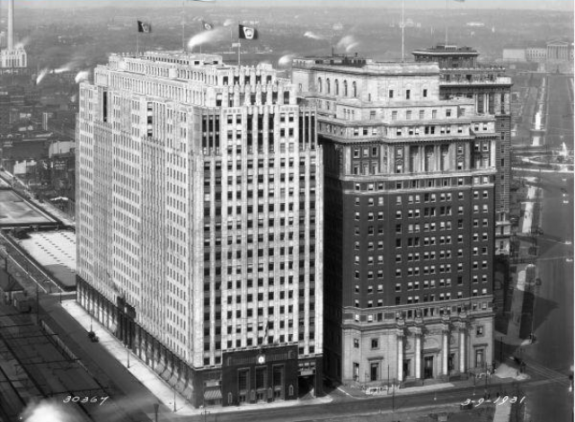 During the latter half of the twentieth century, corporate mergers transformed some of Philadelphia’s oldest insurance companies. INA, founded in 1792, merged with the Connecticut General Life Insurance Company to form CIGNA in 1982. The resulting entity was purchased by ACE Group, an international company with more than $87 billion in assets, in the 1990s.One might be tempted to conclude that Philadelphian insurers had reached the final stage of their journey into global capitalism, but it is important to recall that Philadelphia insurance companies were worldwide businesses from their very origins. INA, today linked through its corporate successor with offices in Tokyo, London, Zurich, and Santiago, made its name more than two centuries earlier by insuring merchant ventures to Amsterdam, Port au Prince, St. Petersburg and Jakarta. Over nearly three centuries, insurance has forged connections between Philadelphians and their neighbors, their fellow citizens, and their business partners around the world. Hannah Farber is a Ph. D. candidate at the University of California, Berkeley, completing a dissertation on early American marine insurance in politics and culture. During 2012-13 she held fellowships at the Library Company of Philadelphia and the McNeil Center for Early American Studies. Baranoff, Dalit. “Fire Insurance in the United States.” EH.Net Encyclopedia, ed. Robert Whaples. Black, Samuel P., Jr., and John Paul Rossi. Entrepreneurship and Innovation in Automobile Insurance: Samuel P. Black, Jr. and the rise of Erie Insurance, 1923-1961. New York: Routledge, 2001. Fowler, John A. History of Insurance in Philadelphia for Two Centuries (1683-1882). Philadelphia: Review Publishing and Printing Company, 1888. James, Marquis. Biography of a Business, 1792-1942: Insurance Company of North America. Indianapolis; New York: Bobbs-Merrill Co., 1942. Kingston, Christopher. “A Broker and His Network: Marine Insurance in Philadelphia During the French and Indian War, 1755-1759.” 2007. Murphy, Sharon. Investing in Life: Insurance in Antebellum America. Baltimore, Md. : Johns Hopkins University Press, 2010. Wertheimer, Eric. Underwriting: The Poetics of Insurance in Early America, 1722-1872. Stanford: Stanford University Press, 2006. Map Collection, Free Library of Philadelphia, 1901 Vine Street, Philadelphia. 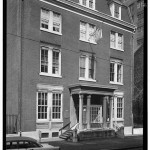 Twentieth Century and Insurance Collections, Historical Society of Pennsylvania, 1300 Locust Street, Philadelphia. Insurance Company of North America Archives, ACE Group, 436 Walnut Street, Philadelphia. Economic History Manuscripts and Print Resources, Library Company of Philadelphia, 1314 Locust Street, Philadelphia. Philadelphia Contributionship Digital Archives, Philadelphia Architects and Buildings Project. “Insurance Row,” Walnut Street between Second and Sixth Streets, Philadelphia. Insurance Company of North America Building (The Phoenix), Sixteenth and Arch Streets, Philadelphia. Philadelphia Contributionship for the Insurance of Houses From Loss by Fire, 212 South Fourth Street, Philadelphia.